A look back at our recent stories on this increasingly political issue. It’s that time of year again. Kids are headed back to school and their lunch is on our minds. 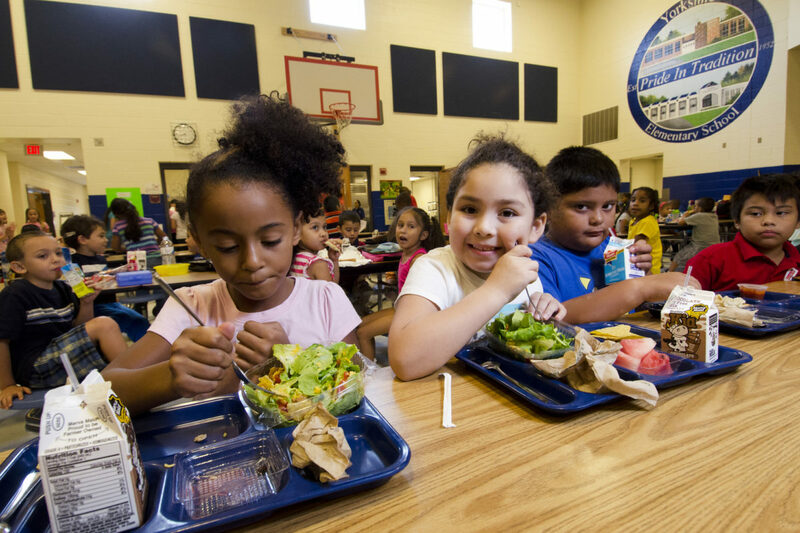 School food has been a hot button topic since 2010, when First Lady Michelle Obama launched Let’s Move!, her hallmark program to end childhood obesity, and the U.S. Department of Agriculture (USDA) updated its nutrition standards for school cafeterias. For the last five years, we’ve worked hard to shine a spotlight on this complex, highly political issue. In this month’s editor note, I’ll take a look at our stories as a quick primer of what you need to know. In addition to sharing many of the stories Siegel writes on The Lunch Tray, she has written a number of original stories for us, including last year’s “state of the tray,” in which she gave an update on school lunch policy. At the time, she noted the initial moves by the School Nutrition Association (SNA) to begin rolling back the Healthy, Hunger-Free Kids Act, a set of legislation that led the USDA to overhaul outdated school breakfast and lunch nutritional standards. Today, we published an update from her on the current Child Nutrition Reauthorization process in Congress, which is expected to go full steam ahead this month, and will likely see healthy food advocates fighting the SNA’s proposed changes. Last month, she wrote a hard-hitting piece about how the SNA pays mom bloggers who are admittedly not experts on the topic to shape the conversation about school food. She has also reported on how Texas (her home state) passed a law to keep junk food in schools; how daycare programs ask parents for a doctor’s note if they want to send healthy food along with their kids (and how the USDA’s proposed daycare meal standards offer small improvements, but still fall short); on McDonald’s efforts at in-school marketing; and how a “clean” label for school lunch might be unrealistic. In a collaboration with contributor Nancy Huehnergarth, Siegel explained how striving to be perfect can be the enemy of good when it comes to school food reform. Huehnergarth has also written extensively for us on about kids and food, including a piece about how food education belongs in the schools, and Gatorade’s efforts to convince youth that water is the enemy via a video game (the story got the attention and action of the New York State Attorney General). Huehnergarth has also reported on how the food industry has been working to create ultra-processed breakfast foods formulated to meet the new school nutrition standards. In between these food fights, we’ve also profiled real food school heroes, including Chef Ann Cooper (AKA the “Renegade Lunch Lady”) who we wrote about five years ago, and the pioneering efforts of Alice Waters’ Edible Schoolyard. More recently, we introduced our readers to Betti Wiggins, another renegade who has led Detroit’s school kids through a food revolution. Our coverage has also included stories on how schools struggle to keep real food on the menu as their budgets get sliced and diced. And we’ve written about enterprising organizations like Schoolyard Farms and FoodCorps, which trains young people to teach kids about healthy food, building and tending school gardens with them, and collaborating with school food staff to get high quality local food onto school lunch trays. We also tracked the progress of D.C.’s first full-time school garden coordinator, hired by the D.C. Public School System. Elementary schools aren’t the only places where changes to the menu are needed. We’ve followed organizations like the Real Food Challenge, which have been powerful advocates for food reform on college campuses. We’ve shared stories from them on how students are transforming cafeteria food service, how they signed a food chain transparency agreement with Sodexo, and how they are fighting for more food justice. And we’ve written about how campus-based programs, like Food Collective Action in Portland, Oregon, which works to promote justice within the community food system, and how community colleges are helping to grow the good food movement. We’ve reported on how the new Global Food Initiative at U.C. Berkeley is also looking at food on a more local level, starting with its own campuses, and how the We Over Me Farm at Paul Quinn College in Dallas, Texas, replaced a losing football team with a thriving vegetable operation. Back in 2011, Managing Editor Twilight Greenaway interviewed then-Deputy Secretary of Agriculture Kathleen Merrigan on her innovative work to drive farm-to-school efforts. Since then, we’ve been tracking the rise of farm-to-school, from the USDA’s pilot farm-to-school programs, to how some counties are using “speed dating” to connect farms to schools and other institutions. We’ve also shared stories about classroom-to-cafeteria curricula and the burgeoning farm-to-preschool movement. There’s still so much for us all to learn about school food and we will continue to update you with developments as they unfold. And I’m excited to report that I’ll be going back to school myself. This month, I’ll be joining a cohort of 18 other journalists from around the world at Stanford University as a John S. Knight Fellow in Digital Innovation. (I’ve heard the food is pretty good there.) I’ll be reporting back over the coming academic year about what I’m learning and on my efforts to make food policy news part of the daily American media diet.